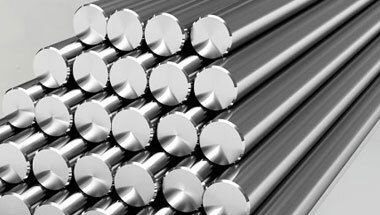 Titanium Round Bars & Rods Manufacturer, Titanium Alloy Gr2/Gr5 Round Rods Supplier & Exporter in India. Manufacturer & Exporter of Titanium Gr5 Round Bars & Rods, Titanium UNS R50400 Hex Bars, Titanium Grade 2 Square Bars & Titanium Grade 5 Round Rods Supplier in India. Among our wide range of Round Bars & Rods products, we also manufacturer & export a premium quality assortment of Titanium Alloys Round bars & rods to our valued customers spread across the globe. These products are manufactured with the help of modern techniques using optimum quality material. Offered products are thoroughly examined on different quality parameters for make certain its superiority at our end. Our Titanium round bars & rods are known for resistant to general corrosion, crevice corrosion, intergranular attack & pitting and stress corrosion cracking. Titanium Bars available in GRADE 1, GRADE 2, GRADE 5, GRADE 12, TI6AL4V, MEDICAL GRADE, SURGICAL GRADE in various sizes and cut lengths required by customer. Titanium Round bars & rods are used extensively in various industries such as Sugar, Chemical & Fertilizers, Paper, Engineering, Textile, Dairy,to more complexes such as Oil & Gas, Petrochemical, Power Generation and Nuclear Industries etc. Titanium Alloy Gr2 Rods, Titanium Werkstoff Nr 3.7035 Round Bars, Titanium Gr5 Round Rods, Titanium Alloy Gr5 Hexagonal Bars, Titanium Gr2 Bright Bars Supplier & Gr5 Bars Exporter in India. Standard ASTM B348 / ASME B348, ASTM B 863 / ASME SB 863. Colombia, UAE, Ethiopa, Egypt, Nigeria, Italy, Indonesia, Ghana, Australia, United States, Peru, Bahrain, Malaysia, South Africa, Canada, Uganda, Trinidad and Tobago, Cameroon, Saudi Arabia, Kuwait, Argentina, Democratic Republic of the Congo, Algeria, Russia, Chine, London, Sri Lanka, Brazil, Turkey, Germany, Sudan, New Zealand, Iraq, Israel, Angola, Mexico, Dubai, Vietnam, Kazakhstan, Venezuela, UK, Houston, Azerbaijan, Thailand (Bangkok), Morocco, Jordan, Africa, Mozambique, Iran, Tunisia. Khartoum, Zaria, Conakry, Abu Dhabi, Kinshasa, Hong Kong, Muscat, Bulawayo, Mogadishu, Riyadh, Kano, Rabat, Lubumbashi, Tripoli, Soweto, Freetown, Addis Ababa, Ibadan, Harare, Port Harcourt, Douala, Amman, Nairobi, Byblos, Lagos, Dammam, Alexandria, Cairo, Port Elizabeth, Singapore, Tel Aviv, Durban, Tehran, Maiduguri, Bethlehem, Sharm el-Sheikh, Brazzaville, Algiers, Jeddah, Kampala, Cairo, Subra al-Haymah, Mbuji-Mayi, Fez, Abidjan, Johannesburg, Data from the UN, Pretoria, Mecca, Aqaba, New York, Lusaka, Jerusalem, Dubai, Kaduna, Ouagadougou, Benin, Cape Town, Accra, Manama, Luanda, Antananarivo, Omdurman, Dar es Salaam, Dakar, Bamako, Giza, Beirut, Yaoundé, Colombo, Doha, Casablanca, Istanbul, Kolwezi, Maputo.